Arsenal FANS Africa/The Gooners | "Arsenal we trust in!" Arsenal ace Santi Cazorla says he was left excited ‘like a kid’ when Arsene Wenger told him that the Gunners had signed Mesut Ozil from Real Madrid. Ozil moved to the Emirates Stadium in a club-record £42.5million deal on transfer deadline day, in a surprise switch. And Cazorla says he was left feeling all giddy when he was told that he would be lining up alongside the German. ‘I spoke to friends of mine at Madrid who told me that Mesut was talking to Arsenal and that he wanted to leave,’ explained Cazorla. ‘You think, “How are Madrid going to let Mesut get away?” He’s one of the best players in the world and the truth is you don’t really believe it. ‘Then one day the manager said to us, “We’ve signed Mesut, he’s going for his medical”. ‘I was like a little kid. Ozil has since had an important impact on the Arsenal team, bagging a number of assists, while also helping them top the Premier League table. Just a few weeks before he was set to wear the red-and-white stripes of Stoke City, the club confirmed on Wednesday that Juan Agudelo wouldn’t, in fact, be signing. Why? Because of the decision by the powers-that-be that he. The international break came at the best of times but also the worst of times for Chelsea. A fortnight after our discouraging draw to West Brom, Jose Mourinho’s men will have experienced two weeks of both reappraisal and concern. Cristiano Ronaldo has insisted he is ‘not obsessed’ with winning the Ballon d’Or just hours after reports suggested he could boycott the awards ceremony. That’s the trouble with these ‘top of the table’ clashes. For those of us involved they become a bit ‘run of the mill’, more a spectacle for the neutral. For the fans of the two clubs it’s just another fixture on the calendar. The home fixture with Crystal Palace has the feel of a very big game for Hull City. From the day the fixture list was produced it was identified as a ‘winnable’ home game. The Tigers will be solid favourites to win the game given their unbeaten home record and the disarray in the visiting camp. Daniel Agger admits he was ‘tempted’ to quit Liverpool for Spanish giants Barcelona, but his principles kept him at Anfield. Can a Merseyside derby with two contenders rekindle atmosphere of old? The Merseyside derby is a fixture that is no doubt one of the classics of the English game. They are some of the most feisty, passionate and dramatic derbies in England, and even internationally. With a series of pointless international friendlies now done and dusted until the new year, focus can firmly return to the bread and butter that is domestic football. In Sunderland’s case this involves a trip to the once Fortress Britannia, looking to build on some promising performances and results of late. Lionel Messi is ready to put Manchester City on red alert by announcing he wants to leave Barcelona at the end of the season. Messi, who is a graduate of the Barca academy. Sport Reporter. Working across Metro’s online, mobile, print and tablet editions, covering the sporting moments that grip the nation. On Twitter @Sanderson. Theo Walcott could make his first Arsenal appearance for more than two months on Saturday after recovering from an abdominal injury. 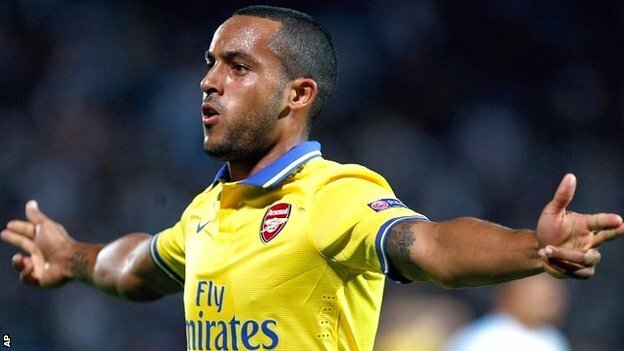 Walcott is in the squad to face his former club Southampton on Saturday. The 24-year-old pulled out of the league match with Stoke on 22 September after aggravating the injury four days earlier against Marseille. “He has not played even a reserve team game, but I will put him in the squad on Saturday,” said boss Arsene Wenger. Wenger initially deployed Serge Gnabry in Walcott’s role, but has since had his midfield options strengthened by the return of Mikel Arteta and Jack Wilshere. “Theo has different qualities to other players and I am very pleased that he’s back,” Wenger added on Arsenal’s official website. Arsenal were level on points with Tottenham at the top of the Premier League before Walcott’s injury prior to the Stoke game. They now have a two-point advantage over Liverpool in second. Nicklas Bendtner has told the Danish media he will consider leaving Arsenal in January in search of regular first-team football. The 25-year-old, who was strongly linked with a move away from Arsenal during the summer transfer window, has found himself playing a bit-part role for the Premier League leaders so far this season. Bendtner admits that, if he was to move, it would be to a club where he would be playing on a regular basis after growing frustrated with his situation at Arsenal. “It is the sporting challenge which is the most important,” Bendtner is quoted as saying in Politiken. “It should be a club where I will be happy to play. It should be a club where I get to score and preferably win something. Bendtner has also refused to rule out the possibility of ending his career in his native Denmark with former club FC Copenhagen. 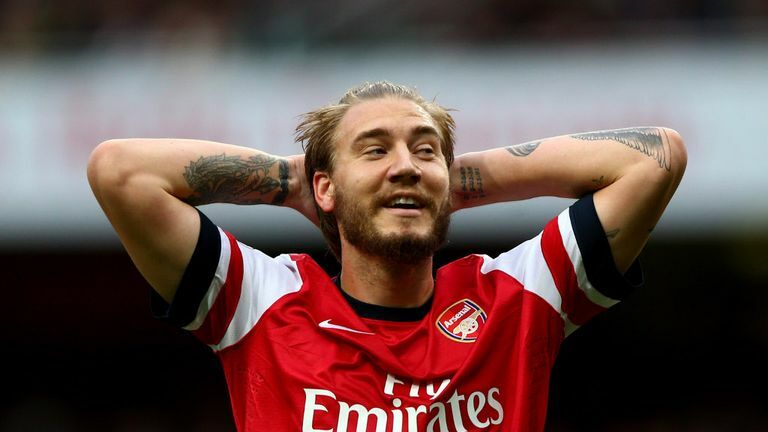 “I might consider ending my career at FC Copenhagen and give the Superliga a try at the end,” Bendtner added. Arsenal are hoping to strengthen their options in attack with the signing of former AC Milan striker Alexandre Pato in January. Olivier Giroud remains the club’s only recognised front man and Gunners boss Arsene Wenger has made landing a new forward his number one priority when the transfer window reopens in the new year. Pato was a target for the north London club this time last year while he was still with the Rossoneri but the 24-year-old opted for a move back to his native Brazil, joining Corinthians. However, a fall-out with the club’s coaching staff has left the Brazillians open to a sale for around £10million in January. Tottenham are also interested having missed out on the striker in the summer, but is thought that the Gunners are now leading the race for Pato’s services and are increasingly confident of landing their man. Worried by Friday’s 2-0 defeat for England against Chile? Don’t be. England are doing just fine. Spurs might not be playing, yet the headlines simply won’t go away. Nicklas Bendtner seems to have spent his time away on international duty telling the media he doesn’t want to talk about Arsenal and then proceeding to do just that. West Ham are being linked with a host of strikers who could be snapped up in January to help fire them up the Premier League. Sunderland manager Gus Poyet wants South Korea midfielder Ki Sung-Yueng to stay at the Stadium of Light on a permanent basis. Everton manager Roberto Martinez has hailed rising star Ross Barkley, describing the youngster’s technical ability as similar to a player from Brazil or Holland. Liverpool finally believe they have won the race for Derby County midfielder Will Hughes. Aston Villa are expected to make a January move for for Torino full-back Danilo D’Ambrosio. Arsenal fans will have a chance to meet Gunners legend Robert Pires when the ex-France international takes part in an exclusive signing session in The Armoury ahead of the Southampton game on November 23. Pires will meet up to 200 supporters 12pm to 1.30pm in the Club’s flagship store, where he will be on hand to sign copies of a limited-edition framed photo montage featuring some of his most memorable moments in an Arsenal shirt. Fans will then be able to get their personally-signed print framed immediately in-store, with each of the 200 pieces individually numbered. Supporters are encouraged to arrive early to avoid disappointment. The exclusive print, which will only be available during the session, celebrates the Frenchman’s six years with the Club, during which he helped the team to two league titles and two FA Cups, netting 84 goals in 284 appearances. To be eligible for the signing, fans must purchase a signed and framed copy of the photo, priced at £50. Only 200 framed photos are available and priority will be given to the first attendees. Only one signature per exclusive framed photo purchased on the day.